Columbus, Ohio – November 7, 2017 – Thomas Built Buses, along with its parent company Daimler Trucks North America (DTNA), will debut leading technologies and innovations at the NAPT trade show November 7. Thomas Built’s booth features key technological advancements from Thomas Built Buses, and from Detroit Diesel Corporation, Freightliner Trucks and Mercedes-Benz USA. Thomas Built Buses continually incorporates innovations that make school buses safer, more efficient and easier to maintain. These include safety features in the new BusWise™ suite of technologies and the revolutionary Saf-T-Anchor Removable Seat (S.T.A.R.S.) mounting system for buses for students with special needs. · Saf-T-Liner® C2 Electric First Generation Bus, Jouley: This is the newest addition to Thomas Built Buses’ product line-up. 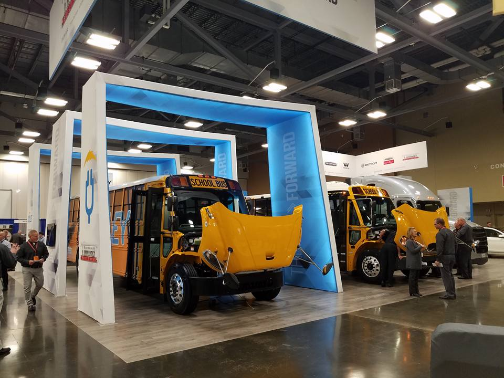 The Saf-T-Liner C2 Electric is an all-electric school bus that is powered by the Efficient Drivetrains, Inc. (EDI) PowerDrive™ 7000EV engine, which provides 100-160kWh of battery energy and a baseline 100-mile range with expandable mileage available. It comes equipped with the EDI PowerSuite™, which provides vehicle control software and EDI PowerTracker™ telematics and diagnostics system that track bus location and real-time monitoring of potential issues. The EDI Power2E™ which provides exportable power comes standard on the Saf-T-Liner C2 Electric. It meets 2017 greenhouse gas (GHG17) standards, utilizing such innovative technology as variable exhaust cam phasing, which allows additional heat into the exhaust. This new technology enables efficient operation of the aftertreatment system in low speed stop-and-go operations, which is ideal for school buses, and dramatically decreases the aftertreatment headaches currently experienced by many fleets. The DD5 engine also comes equipped with the Detroit Connect Virtual Technician remote diagnostics service, the most in-depth and the only telematics solution of its kind in the industry. * (Or 18 months or 1,500 hours, whichever comes sooner). · Detroit DD8 engine with Detroit Connect Virtual Technician Remote Diagnostics Service: The Detroit DD8 engine is a 7.7L in-line 6-cylinder medium-duty engine specifically tailored to the demanding requirements of Thomas Built Buses Saf-T-Liner® HDX. It boasts a horsepower range of 260-300HP and a torque range of 660–860 lb.-ft. The DD8 offers longer maintenance intervals and improved fuel efficiency. It meets 2017 greenhouse gas (GHG17) standards and utilizes a global medium-duty engine platform that benefits the pupil transportation market particularly well. It also employs such innovative technology as variable exhaust cam phasing, for more efficient aftertreatment system performance, helping to reduce issues previously experienced in low-speed or stop-and-go operations. It also offers the most advanced connectivity platform in the pupil transportation industry, Detroit Connect Virtual Technician remote diagnostics service. · Mercedes-Benz S-Class: The Mercedes-Benz S-Class is the epitome of innovation on the road. It is equipped with technologies and innovations that are state-of-the-art for the transportation industry and possible precursors for the future of the school bus industry. Stability and control have never been easier, with features like the Magic Body Control®, which is the world’s first proactive suspension system. It scans the road ahead with a stereo camera and generates forces to counteract bumps and dips as you reach them, not after. And driver comfort and control don’t get much better with the panoramic control panel, which is composed of dual 12.3-inch widescreens set side-by-side to create a seamless floating frame. Each screen, which includes a reconfigurable instrument panel and a central screen for entertainment, navigation and more, delivers a wealth of information to the driver with instant clarity. Two smartphone-like pads access nearly all of the car’s features directly from the steering wheel. The driver can scroll, swipe and select from the central screen with the right thumb, and the screen between the gauges with the left. An industry-first Energizing Comfort Control system provides climate comfort, fragrance, massage, lighting and music. Enhanced ambient cabin lighting offers a choice of 64 colors in a variety of themes. · The new Freightliner Cascadia® with Detroit Assurance® Suite of Advanced Safety Systems: With a sleek aerodynamic design and the updated Integrated Detroit™ Powertrain, the new Cascadia is the most advanced truck ever designed by Freightliner Trucks. The newly-designed Cascadia is focused on improved performance, enhanced driver comfort, fuel efficiency, safety, connectivity, quality and uptime. The new Cascadia truck comes with the option of the Freightliner Driver Loft, which features groundbreaking sleeper design and ergonomics, including a multi-faceted dinette/work table and opposing seating with safety belts. The seats and dinette can be folded down, and a comfortable Murphy-style bed deploys from the back wall. Additional standard features include aircraft-inspired LED ambient lighting and a dimmer switch for personalized light adjustments. The Cascadia is impressive to look at, but the real innovations are under the hood. The Freightliner Cascadia is equipped with Detroit Assurance 4.0, which provides active brake assist, adaptive cruise control and lane departure warnings by utilizing a bumper-mounted radar and a windshield-mounted camera. The Cascadia also is linked to the Detroit Connect Virtual Technician remote diagnostics service, the same groundbreaking telematics service that is now available to drivers and fleet managers who purchase school buses with the Detroit DD5 or DD8 engines. Founded in 1916, Thomas Built Buses is a leading manufacturer of school buses in North America. Since the first Thomas Built bus rolled off the assembly line, the company has been committed to delivering the smartest and most innovative buses in North America. Learn more at https://thomasbuiltbuses.com or at http://www.facebook.com/thomasbuiltbuses. 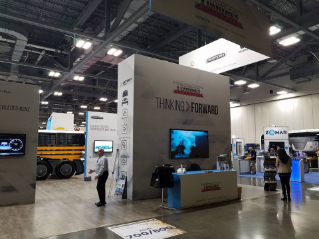 Detroit offers a complete line of heavy-duty and medium-duty diesel engines, axles, transmissions, safety systems and connected vehicle services for the commercial transportation industry in both the on-highway and vocational markets. Detroit™ products are sold and serviced through a network of hundreds of locations throughout North America. Detroit™ is a brand of Detroit Diesel Corporation, a subsidiary of Daimler Trucks North America LLC. Daimler Trucks North America LLC, headquartered in Portland, Ore., is the leading heavy-duty truck manufacturer in North America. It manufactures, sells, and services commercial vehicles under the Freightliner, Western Star, Detroit, and Thomas Built Buses nameplates. 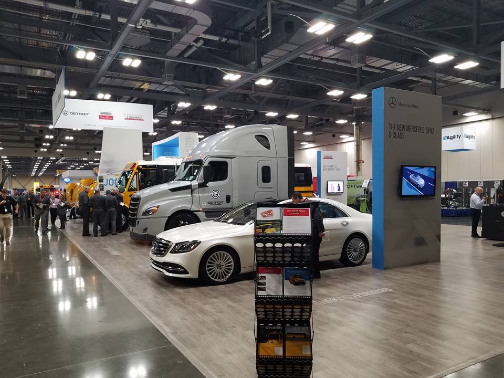 Daimler Trucks North America is a Daimler company. Mercedes-Benz USA (MBUSA), headquartered in Atlanta, is responsible for the distribution, marketing and customer service for all Mercedes-Benz products in the United States. MBUSA offers drivers the most diverse lineup in the luxury segment with 15 model lines ranging from the sporty CLA-Class four-door coupe to the flagship S-Class and the Mercedes-AMG GT S.
MBUSA is also responsible for Mercedes-Benz Vans and smart products in the U.S. More information on MBUSA and its products can be found at www.mbusa.com, www.mbsprinterusa.com and www.smartusa.com. Accredited journalists can visit our media site at www.media.mbusa.com. Follow us on Twitter @MBUSAnews.